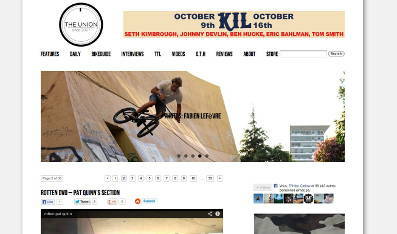 Kurt Hohberger, www.bmxunion.com: BMXunion was started in September of 2007 as a semester long Mass Communications project on how blogging can reach many people. After the semester was over, I continued to keep the site rolling. It has grown and become much more than I would have ever expected. It gave me a lot of opportunities to become more involved with BMX and do the things I like to do like photography, filming and editing, and traveling. It has opened my eyes up to the world a little more, and lead me to meet some very unique and awesome people along the way. Its hard to imagine where I would be today with out this. In 2011, the website changed the name to The Union and became a full-time project. You can find original interviews, product features, photo galleries, videos and more. You can also find the Daily section which is loaded up a few times a day with all of the latest videos, news, products and more. We've had over 10 million hits per month since august last year. That comes down to over 300,000 hits per day. Cream december 1999: Deaner is re-stylin FAT to make it even phatter and better. New categories will include the University of BMX by the one and only Gerrit Does... word! 2007: 1.0 million unique visitors. 2008: 1.5 million unique visitors. 2009: 2.2 million unique visitors. French website. Le site du magazine Soul. Ben Bello, avril 2007: Nous ouvrons notre site internet à 20h ce samedi 14 avril 2007. Un site où nous vous invitons à participer en nous envoyant vos news les plus fraîches, vos vidéos, vos photos, vos suggestions, vos souvenirs, vos commentaires... Toutes vos contributions sont les bienvenus car elles serviront le dynamisme d'une scène Française qu'on espère toujours plus dynamique. Rendez vous donc (pas tous en même ça va faire chauffer le serveur:) sur le www.3615soul.com. Janvier 2009: ouverture du forum. thecomeupbmx.net, 2006: The Come Up was started by Adam Grandmaison aka Adam22 in 2006, a professional poker player and lifelong BMX rider from Nashua, New Hampshire who currently resides in New York City. Steve DFTU has also recently been added to the site to make sure the UK is properly represented. One of the goals of The Come Up is to help get exposure for kids who are doing awesome things on their bikes without getting noticed. That's what "coming up" on something means, elevating your situation and making something of yourself, not necessarily making money or getting fame from doing tricks on your bike. Adam Grandmaison, www.ridebmxmag.co.uk, january 2008: The main page gets like 12-13,000 unique visits every day. And I know that the board and the main page combined get about two million page views a month. thecomeup.com, august 2012: Thecomeup.com has now officially replaced thecomeupbmx.net. Ride BMX UK magazine's website. 2008 website editor: Robin Fenlon. Cream december 1999: http://wwww.rosecott.demon.co.uk/rideuk/ C'est du nouveau, en fait il n'y a rien ou presque, il doit être "under construction". Parallèlement au gros succès d'un groupe facebook sur le bmx français, Franck Belliot crée ici en octobre 2011 un lieu pour regrouper et organiser les documents collectés. Ride BMX US magazine's website. Formerly www.bmxonline.com. Online since 1999. Associate Online Editor: Fat Tony. New site July 17, 2008.
www.bmxnews.com, august 2006: Theres a new site in town and it's a cool one. If you like Myspace your gonna like VitalBMX.com. From the minds of former BMX Mag creater, Brad McDonald and Photog Mark Losey they have come up witht the prefect blend of BMX and user interaction. Be the first to get signed up at VitalBMX.com before someone grabs your screen name. VitalBMX.com has current BMX News and a whole lot more. We have been listening to your feedback and we put it to work in our latest version of Vital BMX. This new system is more sleek and to the point, and should get you exactly what you want to see as fast as possible. Take a look around, get involved, and let us know what you like or would change. This is not our websiteit's yours, so take advantage. We plan to keep rolling out more improvements so keep an eye out. Enjoy, and thanks for making Vital the number one site in BMX. Le sauteur de bosses Quentin Labadens est le web maître de ce site où on découvre des news, une indispensable carte de France des spots et d'autres trucs avec une présentation simple et efficace. Merci Godasse. Les suspensions et retours du forum s'enchaînent en fonction de la quantité de gros mots que Quentin parvient à supporter. Soul mai 2001: http://godasse.free.fr si vous cherchez des spots près de chez vous ou si vous voulez faire connaître votre spot. C'est bien foutu et ça mérite d'être connu. D'autant plus que Godasse est un activiste de l'internet bmx des premières heures. The cyber-home of old school BMXers and freestylers around the world. Bill Curtin, Hal Marshman, and Rick Thomas are the guys responsible for this website. Hal, www.vintagebmx.com, september 2005: I quit racing bikes and got into drag racing. Fast forward 20 years...Bored at lunch at work one day I was looking around and found Oldschoolbmx.com. I looked around and saw Bill C. I caught up to him in the chat and found it to be Bill Curtin. I started to hang around that site and offered to help just about the time it imploded. I have been here for Bill ever since. Helping the website and meeting some real cool folks. I even reignited my racing career but that has come to a sudden stop. It's a place for flatland riders from all over the world. We collect news, video and photo material, articles, reviews, dates and lots more to share it with everyone. Martin Schulz, Flat Kings, 2007: The start of a new flatland website - global-flat.com. When I write this text it's almost 10 years ago that I got into flatland. I'm still far away from being a good rider and it would probably take at least 10 more years to become one. Nevertheless I think I already managed to contribute something to the world of flatland. When I got back into flatland after a longer break I started looking around in the internet for some information about my beloved sport. Beside some forums there was no serious source of information. The holy website theflatlander.com was about to die so it was really time to start something new. Since I was into computer stuff anyways it wasn't too hard for me to build a website (from the technical point of view). It turned out to be a little bit more complicated to find a good team and to let people know that this website exists, especially when the potential visitors are spread all across the globe. In the very beginning a lot of people wanted to be part of the globalflat team and joined a brainstorming forum. Many ideas came up here and even the name "global-flat" was born in this forum. In the following weeks and months I started building the technique behind the website and we filled the site with the first content. The very first news on global-flat was posted on the 6th of November 2004. Not so long ago. The news are somehow the core of global-flat. We always try to keep them as international as possible -just like flatland is. While I'm writing this text I clicked through our first news in 2004. I found a post with a birthday cake - headline: "One month global-flat.com". It's quite funny to read it today because of this sentence: "We had nearly 5000 pageviews this month what is quite a lot in my opinion!". Well, today we have around 20.000 pageviews per day and again I would say that's quite a lot in my opinion. Hopefully (in a few years) I can laugh about this statement as well. That was my little contribution for this big book about flatland. If you want to find out what's going on in the world of flatland then please visit our site: www.global-flat.com. Ride on! Les pages de 23mag sont hébergés par www.anazys.com et sont parfois conformes .